Join Proland and earn big commissions selling prime land! Join Proland and make top commissions selling apartment land! 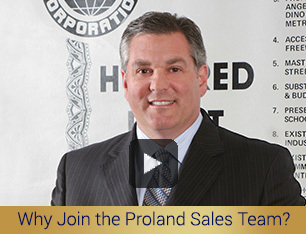 Join Proland and get excellent training for your successful land sales career! Join Proland and earn top commissions selling prime retail and commercial land! Want to be alerted on upcoming sales training hosted or sponsored by Professional Land Corporation? Simply fill in the form below, and click “Submit" to be added to our list. That’s all there is to it. Your information will be kept strictly confidential, and will not be given out to third parties. We'll contact you with the potential event information as it becomes available and how you might register for each. There is no obligation whatsoever. You can email: tony@proland.com at anytime with the subject line: "Unsubscribe Me from Training Notifications" to be removed from our list. Want to learn how to join ProLand? Simply fill in the form below, and click “Submit" to be added to our list. That’s all there is to it. Your information will be kept strictly confidential, and will not be given out to third parties. We'll contact you on how to join ProLand. There is no obligation whatsoever. You can email: tony@proland.com at anytime with the subject line: "Unsubscribe Me from How to Join ProLand" to be removed from our list. To get this free, "Proland Newsletter on Hot Growth Areas" delivered to your email box immediately, simply fill in the form below, click “Submit", wait for the confirmation email, and reply back that you want the Newsletter. That’s all there is to it. Your information will be kept strictly confidential, and will not be given out to third parties. There is no obligation whatsoever. EARN LARGE COMMISSIONS MARKETING PRIME LAND IN SOUTHERN CALIFORNIA’S NEXT MAJOR LAND BOOM! Learn how you can earn large commissions selling residential, multi-family, industrial or commercial zoned land parcels in Southern California’s Inland Empire or Antelope Valley with an affordable down payment and excellent long-term financing. The Professional Land Group of Companies is the owner of all of the land we offer. This private inventory of properties is only available through Professional Land Corporation. Copyright 2019© Professional Land Corporation® All Rights Reserved. The reproduction, duplication, distribution, publication, modification, copying or transmission of text and images from this Site is STRICTLY PROHIBITED unless you have obtained the prior written consent of Professional Land Corporation.